Now that we have reviewed the musical notes and rests and their various symbols along with their respective meaning in terms of duration, we can begin to learn about other tools which can change the duration of a note or a rest regardless of its current note or rest shape. The changes we will be addressing in this article will alter the duration of the note or rest by making a subtle change to their individual shapes. By using a single or double dot we alter their duration in certain and specific ways. 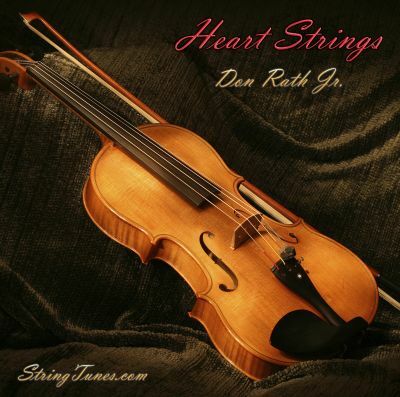 This article, Dotted Notes and Rests – Part 13, is about that idea. We will explore each type of dotted note and rest, compare them to one another and demonstrate the impact of using the dotted notes and rests on the rhythm of the music in a basic sense. We have included charts and mp3 clips to provide examples and to demonstrate the use of the concepts within this article. Comment: When I was in High School, one of the subjects that had been proven over and over again as far as being difficult for me was to learn about mathematics. Whether it was geometry, physics, fractions or the basic trigonometry and calculus courses I had to take. All were difficult for me to learn. I did well but it took a lot of study and additional mentoring for me just to “get it”. I think it had something to do with the abstract nature of numbers. Even though there is some math involved in music it is much easier to learn than trying to figure out geometry, trigonometry or calculus. Dotted Notes and Rests – Part 13 uses very simple mathematical ideas when using the dot for changing the shape of the symbol. We will learn their meaning and their impact in this article. Music has several of its concepts tied into mathematics and one of those is note and rest values for determining their duration. In earlier posts about them, we presented other information that makes for a good foundation for this article. 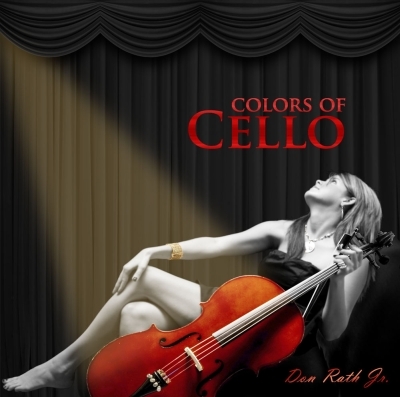 Those posts are; The Musical Note, Note Identification and The Musical Rest – Silence in Music. All of the concepts and ideas presented in them should be understood and if necessary, reviewed again as we will be advancing the concepts of altering note and rest values in this article. Also, you may want to review the blog post Tempo – Speed in Music for an even broader understanding of the impact on note and rest durations as related to the rate at which the music is to be played, otherwise, you may find some of the new information a bit of a stretch. If you fully understand and feel comfortable with the information in the prerequisite articles then please feel free to continue with this article. Within the prerequisite articles there are presentations as to note and rest shapes or the various symbols used to represent how long a note or rest is to be held, i.e. whole note, half not, quarter note, etc. Note or rest shapes by themselves only begin to the lay the foundation for determining the actual duration of a note or rest. By “actual”, I simply mean what we experience as far as duration or how long the note or rest lasts within our perceptions. Also, by now, you should be familiar with the 4/4 time signature used in several of the preceding articles. This is the same time signature we will be using throughout this article. 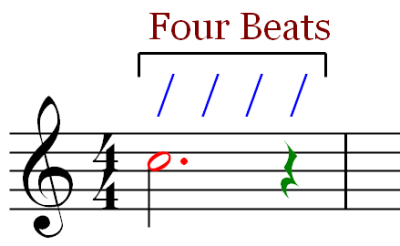 As a reminder, the 4/4 time signature informs us that there are four beats in a measure and each quarter note gets one beat. The time signature also helps to further establish the basis for the actual duration of each. Lastly, in our examples we are using the Moderato tempo at 100 beats per minute. Tempo affects clock time and speed, so all three concepts, time signature, note or rest shape and tempo gives us the actual note or rest duration that we experience while listening to music. The chart below shows a single measure with four quarter notes placed within it. The mp3 clip below the chart reflects the notation in the chart. It is presented here as a point of reference. The link for the mp3 clip of the four quarter notes at Moderato 100 is below the chart. In the second chart below, we have placed four quarter notes in one measure and four quarter rests in the second as a reminder of using the time signature for comparing both choices for the notes and rests and the number or quantity of them in a single measure. This can also serve as a reminder of the quarter note and quarter rest shapes or symbols. 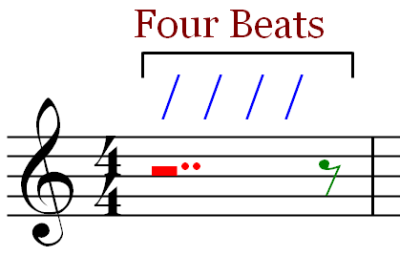 Counting Time – The blue hash marks over the top of the staff are used to count off the beats in the measure and since there are four beats there are also four hash marks as shown. Each quarter note or rest gets one beat so we would count off both measures using this counting format; 1, 2, 3, 4, 1, 2, 3, 4, etc. If there were more measures beyond the two shown, we would continue counting in the same way through each measure all the way to the end of the composition, if no other changes were made to alter anything which affects duration or rhythm. I’d like to point out that “marking” or counting time can be done with one of your feet. The mp3 clip includes three complete measures of music using the C note and at a rate of Andante 100. Each time a note sounds simply tap the time with your foot. The action is simply raising and then lowering your heel, off of the floor and then back to the floor on the beat. Your heel should hit the floor the moment the note sounds. You may also want to say to yourself the number one, then two, then three, then four each time your foot hits the floor to just to get a whole body experience. So, when playing the mp3 clip above mark off each beat by raising and lowering your heel and at the same time count the beats in the measure. If needed, repeat this process until you feel you understand the concept as it is important to begin counting or marking off time. Using the Dot – To take this one step further, since we are using the C note, let us place a dot in the second space below the top staff line, just to the right of both the half note and the half rest as shown in these two charts. Each is marked in red. The green colored quarter rest is not dotted in this example. 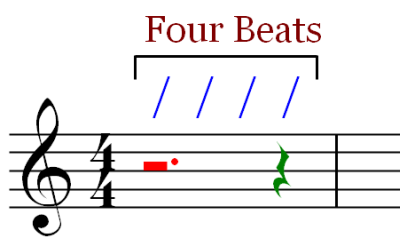 At all times there are only and exactly four beats in a measure when using the 4/4 time signature. What happens to the duration of each when placing a dot next to the note and rest symbols is each note or rest is increased in duration by one half of its original value just by adding the dot next to the notehead. Although the left chart shows the dotted half note you can also use the dot on rests in the same way you can for notes. The example on the right shows this idea. 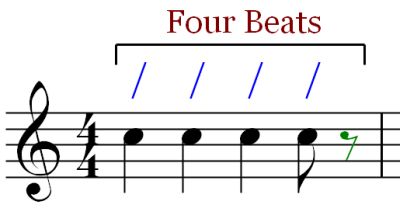 The blue hash marks remain in place to mark off the four beats and in these two examples you will notice that the note or rest is not placed on each beat rather it continues through each beat to its end point. In other words, the original note is held by the performer until the last beat in the measure where the instrument is then silenced on the last beat. In this way all beats are fulfilled as required by the time signature. A closer look – Since we are suppose to complete four beats in a measure in 4/4 time we must fill the remaining beat with something to cover the exact amount of the last beat of the measure, in this case we used the quarter rest shown in green. Note: Sometimes we may have a partial beat in which a quarter note or quarter rest will not fit because its duration is too long for example. In that case we would place any one of the other note or rest shapes such as an eighth, sixteenth or thirty second note or rest whichever fills the remaining time set by the time signature. Sometimes using the dot makes it possible to fill a measure if there is an odd duration of time needed to be filled. 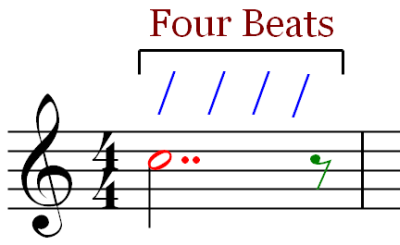 In all cases, both for rests and for notes, the total number of beats or partial beats that remain unfilled in a single measure needs to be completely filled with either a note, rest or a combination of notes and rests that are of equal value as the value of the open or remaining space within a measure. All beats need to be completely filled. The Dot Rule – Since all note shapes and their equivalent rest shapes are of equal value or duration then they are influenced equally when adding a dot to their shape and hence they remain equal in duration under this particular influence. In our example the dotted half note and the dotted half rest are equivalent in duration all else being equal. Placement Variations – Just like regular notes and rests, the dotted notes and rests can be placed in any location within a single measure provided there is enough room within that measure to properly place them based upon their value. It should be stated here that in most cases the placement of a note or rest, dotted or not, and the selected shape of each is based upon where the beat lays and what rhythm and style of music you are writing in. Example 1 – In each measure within the chart below for example 1, we are placing quarter notes, eighth notes and an eighth rest in each of the measures to show the various placements available for the eighth rest. You will notice that the eighth rests can fall anywhere, on a beat or off the beat. There are a total of eight possible locations to place the eighth rest as this chart shows. Example 2 – However, when using the dotted half note everything changes as far as where the notes and rests fall in the measure. The second observation to make is that there are fewer options available to you as a composer within a single measure when using larger note or rest values. Now there are only four options for placing the notes and rests. To hear the exact notation on the guitar represented in the chart below, please play the mp3 clip. In example 2 we can see that there are fewer options and we also see why this is so. The dotted half note can only be placed in four locations within the measure under the 4/4 time signature. There are no other options. Secondly, we can hear the differences in the note values of a quarter note and a dotted half note. Also, please take a close look at the first measure. Notice how the first eighth rest falls on a beat and all of the remaining notes fall off the beat. By changing the location of the eighth rest in each of the next measures we get different note patterns and we create different overall feelings in each measure when listening to them. Lastly, is it more difficult for you to count the time in example 2 than fit is for example 1? For most beginning students example two is very difficult especially because I intentional placed the eighth rest in the first measure to throw you off. Keep practicing these two examples and you will get it sooner than you think! Mp3 Clips – The following four mp3 clips and their respective charts were created by taking each single measure of music in example 2 (above) and we created a total of four identical measures for each of them. We wanted to give you an auditory example of what occurs when moving the eighth rest around in the measure. Each newly created group of four measures sounds completely different than the others even though we are using the exact same note and rest values within each group of measures, they are simply placed differently. We also created them in simple black and white so you could see them as they would normally come up in sheet music. Visually look at each chart first. Then play the mp3 clip. Proceed to the next sample and repeat the same process all the way through all four examples. After that you might want to mix them up to your liking. Be careful though because at 100 beats per minute you might find it a bit difficult to catch just exactly where to start, stop, or pause for that rest in between. Continue until you are satisfied you have learned the concept. The idea of moving around notes and rests within a measure begins our understanding of rhythm. The main article about rhythm will be posted later in this series. The Double Dot – The next topic to discuss for altering the half note and half rest is the double dot. The two charts below demonstrate the double dot and its placement for each. Again both are shown in red. The note and rest shapes are altered by adding a second dot to the right of the first dot and both dots are placed close together. Just as the single dot altered the note or rest duration value, the second dot alters them as well. The Double Dot’s Impact – Let’s take a look at the single and double dotted notes side by side. Keep in mind that the double dotted note or rest also alters the remaining time left in a measure. In the following two charts we are comparing a single dotted half note to a double dotted half note in a single measure. As we can see the remaining time in the first chart is a quarter rest and in the second an eighth rest. The difference in the note and rest shapes between these two charts is simply the addition of the second dot. It gets a bit more complicated to understand when you try to figure out how the quarter rest turned into an eighth rest. Remember we need to fill all beats and partial beats. The solution: The single dot increases the half notes duration by one beat. It adds a quarter note to the duration of the half note. One half of a half is a quarter. As a consequence of this action we now have three full beats covered as far as duration, but wait! There’s more to do. First let’s look at what was just said in a chart. 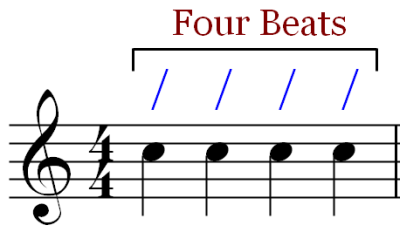 The added beat or third beat filled by placing the single dot next to the half note is then split in half again by the second of the two dots. This action increases the third beat by ½ its duration which is a quarter note. Graphically the double dots effect is seen by using quarter notes in the chart below. The right chart is used for counting purposed only. In the two charts above we are performing the first step in determining how to notate a double dotted half note. The first dot as previously stated, adds one half its value or a quarter note. So, the right diagram shows this step using quarter notes to help understand the concept. Half Note + Quarter Note + Quarter Rest = 4 beats. Now we take the second action required by the double dot by taking one half of the quarter note, an eighth note and placing it at the end of the last half of a beat as seen below. As in the previous example where we added the quarter note, we are adding the eighth note to meet the requirements of the second dot when using the double dot notation mark on the half note. In both cases we fill in the remaining portion of beats using rests to fulfill the 4/4 time signature. So how would we count this measure? As you look at the right chart above, we would count out the four beats in this way 1, 2, 3, 4, “and”. 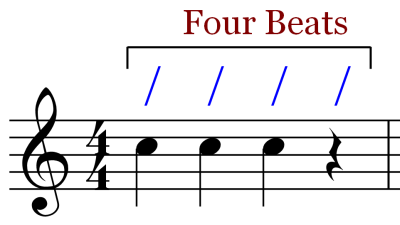 The “and” is used to compensate for the one half beat filled by the eighth rest that remains and is in between beats 4 and the next measure count on 1. Each measure begins with a count of 1. The eighth note falls right on the fourth beat of the measure therefore we count it as the 4th beat. The eighth rest is silent and we need to count the eighth rest as well so to do this we use the word “and”. We would continue this count until some other device such as; another note placement pattern, an altered time signature or a different rhythm pattern is being used. To relate the counting idea for this note/rest setup using our foot metaphor again to assist us in counting the beats of the measure, we would lower our heel to the floor on each beat just as before. For the last beat we would first say the number 4 as we lowered our heel onto the floor. Then as we raised our heel again to prepare for the first beat of the next measure, we would say the word “and”. At this point we would also silence our instrument since we have placed a rest on the last half of the last beat of the measure. Then as we lower our heel again to the floor we are back to the 1 count of the next measure. I think I’ll stop there for now as hopefully I haven’t confused you too much with this explanation. Math can be fun especially when it involves music. We hope we have succeeded in making this group of explanations, clear enough for you to understand the concepts included in this article. For now, we have learned that there are three components that determine the actual duration of a note or rest. 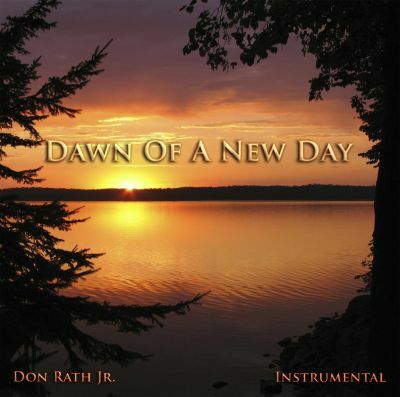 These are; time signature, note or rest shape and tempo or the speed at which the music flows. For single dotted notes and rests we add one-half the original notes value to it and then we fill in the remaining time requirements with either notes or rests. For double dotted notes and rests we learned that the original note or rests value is increased first by one-half of the original note or rest value and then by adding an additional value equal to one-half of the newly created note or rest value to it. If any remaining time in a measure is not filled we need to fill it in with either a note or a rest of equivalent value. This concludes Dotted Notes and Rests – Part 13. We will be addressing and investigating these ideas further in future articles especially when we review rhythm in music as noted. The next article in the Music Theory Section Level 1 is called Barlines – Part 14. This article will explain some additional barlines used in music notation, the measure line, the double measure line and the final ending lines. Please proceed to Scales in Music – A Tonal System, Music Theory Section Level 1 – Barlines – Part 14.